Post in between posts 3 - get to the point! My next post will nevertheless NOT be about Tango. It's gonna deal with the long 19th century and you're gonna see, that this one was longer than others... no kidding. And as these questions are asked so frequently, I will answer them on my blog. This will be a very personal post, in which I cannot avoid to critizise circumstances and people whom I have known personally. But the bizarre fact of being an internationally active Tango teacher whilst living in a Tango free zone, amazes quite a lot of people. So, I‘m gonna take the risk, to alienate a few individuals. If you‘re not interested, better stop reading here! Since the end of the 80‘s, I‘m living in Saarbrücken, a German town with about 200.000 inhabitants, the capital of the Saar region. There‘s quite some culture going on, but the city really awakens in the warm season, when everybody‘s outside, sitting in the street cafes or at the riverside. There‘s lots of students and an alternative ambiance. It‘s the place where I moved to study Psychology and somehow I got stuck here. Most of my non-Tango friends live here and I try to meet them as much as my crazy schedule allows. And: this is the place, where I discovered Tango in 1995. A dancer from Berlin had moved here and started hosting a Practica, that I and Andreas Wichter attended. I am sure, she had the best intentions, but it was exactly what you would have expected in the provinces in this era: Every two weeks, she would show us a new step, that we‘d practice without any idea of technique or communication. There was no Ronda, no connection to the music and of course no place, where you would have danced Tango. From what I know now, we might have found a Milonga in Frankfurt or Karlsruhe, about two hours drive away. But by then, we had no clue. We did not even know that Milongas existed. It was kinda pointless. So, after a year, we abandoned this pastime for more interesting things like our role-playing games. Nevertheless it left us with the feeling, that there might have been more to it. A couple of years later Andreas and I discovered, that one of the former participants of the Practica had started teaching Tango and we decided to give it another try. And although we still remembered most of our steps, we went to the beginner‘s class in January 2000. This is where we met Detlef, who had started to dance 3 years earlier. And when dancing with me, he tried out all the complex steps, that he had learned in workshops. Although he already danced real Tango de Salon in other places, he was also still into the big moves - at least in our home town. So, in my years of absence, the general Tango-philosophy had not changed so much in Saarbrücken: it was about steps in a mostly open embrace, inspired by the classic Tango shows. Again, I was underwhelmed, especially after discovering close embrace by accident, after a couple of glasses Likor 43! But the people where nice, and sometimes dancers from other places would visit, so we started looking around. 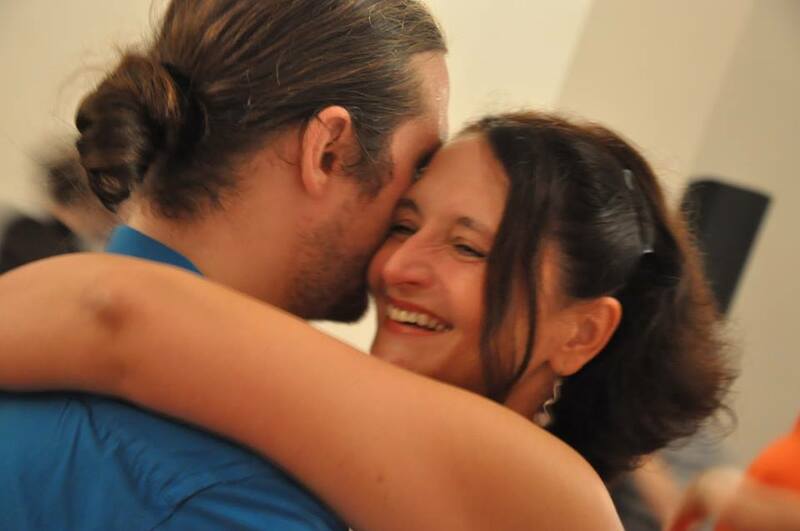 And although our Tango teacher would not tell us the directions, Andreas and I found a Milonga in Kaiserslautern (K-town for the large American population), less than an hours drive away. Now this was something different: Here we discovered Tango de Salon, as it was danced in the traditional Milongas of Buenos Aires. The local teachers focused on the embrace, basic technique and “sentimiento“. This was quite avant-garde in an era, when most of Europe was still doing Fantasia on the dancefloor. In this environment, also Detlef danced more close-embrace. The Milonga at the „Cotton Club“ became our Tango home and we owe a lot to it‘s organisers, who invited quality teachers, some of them still relatively unknown by then. Not all of them were Milongueros, but they taught social Tango with an approach to quality and musicality. The rest was up to us. We began travelling to Milongas in other towns and Tango evens. In late 2000, when I started partnering Detlef, him and I drove as far as Hamburg or Basel, to visit the famous Festivals of this era. Many of you have experienced that part of widening the horizon. But this is where the problems started and our home town developed into a Tango free zone for us. Already in early 2001, I had stopped taking classes in Saarbrücken, as I was looking for a deeper understanding, than the local teacher would offer. In the same year, Detlef and I were asked to run a Practica in Karlsruhe. This seemed to threaten our former teacher, and all kinds of bad stuff ensued. Hey, I was doing a monthly Practica in a town 140 km away! Why did she even bother? Nowadays I understand, that this kind of reactions are not uncommon in the Tango context, but by then I was deeply hurt and stopped going to the local events altogether. So there we were: all revved up, and no place to go. We visited the weekly Milonga in K-Town an hour away, but when we wanted to go to another Milonga, we had to drive at least two hours. And we still had our regular jobs, so dancing more than two times a week was usually out of question. But still we managed to develop our Tango: We danced and travelled as much as we could. Over the next two years, we were asked to teach in several other cities and to organise a monthly Milonga in a small town in our region. And then Andreas took up teaching as well, very soon in co-operation with us. So we met to prepare classes, to develop a common technique and pedagogy. We did learn a lot by thinking, discussing and exchanging ideas in this period. In the meanwhile, two local Argentines, who had discovered Tango with the same German teacher, had started organising Milongas and giving classes in Saarbrücken. In the beginning, I thought this would be a good idea: maybe there would be some Tango for me after all in Saarbrücken. But when I looked at the results of their work, I was frustrated and stopped attending their events. So still no Milonga for me in my hometown! Should I not do something! But what? Although I had vowed, never to teach in my hometown, I was tempted by the idea to help develop the local and regional Tango community. So in 2005 we founded the Tangokombinat with our friends Andreas, Anne-Cecile and (by then) Damian Lobato and Ina. Our comrades commenced teaching, and together we rented a small studio and started organising a Practica libre. But unluckily, none of our friends managed to attract enough local dancers to hold up regular classes and soon gave it up. We never even tried. But since then, we‘ve been organising events in our hometown: Our first ball in the „Johanneskirche“ was a great success and the ancestor of our „Festivalito con Amigos“. In the same year, we initiated a monthly Milonga, that ran for over 4 years and attracted people from a perimeter of 250 km, but almost no locals. And today? What‘s the situation in 2010? The Tangokombinat spread out: Damian teaches in the USA and Andreas is successfully spreading the word in the UK. We gave up our regular jobs, the weekly classes in the greater region and our monthly Milonga in order to teach abroad. Our „Festivalito con Amigos“ grew into an international event, that attracts Tangueros from all around the world, but almost no locals. The small community of less than 50 dancers in Saarbrücken never got to know us, most of them would not even know we exist. No wonder, because we have not visited one of the local Milongas for over five years and they usually do not travel. They are living in their small Tango-bubble, where our former teacher and the two Argentines created some kind of a cult around their personae. So what about the local Tango community? I only know it by the descriptions of others: Just a couple of weeks ago, a friend of mine visited one of the two local Milongas. She was shocked by the lack of connection to the music and by the dangerously big and uncoordinated movements. So now they have gone from a half-open, fantasia-inspired thing to a chaotic-nuevoesk style. This is not the Tango we know and love. That‘s it: I am living in a Tango free zone! Do I bother? Usually not, as we are basically never here. We discovered a world of Tango and made great friends. We would never have experienced this by staying in our hometown. So it is actually a good thing, that I had to travel. So, as we are going to have a free weekend come January, we decided to give an intensive workshop on basics and musicality in Saarbrücken. Apart from one class in 2005 during one of our Festivals, this will be our first and only workshop in our hometown. The rest of the year, we‘ll be travelling again. So far, one local couple registered, the rest are dancers from other cities. Men lead, women follow. The roles in Tango seem to be defined very clearly and for many years, this concept worked nicely. Buenos Aires men used to learn with the Maestros or invent steps with their pals. Women just came to the Milongas and started dancing right away. They did not need classes, just a little practice on the dance floor. And even the most famous female dancers told us, that women do not dance a particular style, they just adapt to the men. But then came the 70s with women‘s liberation and the 80s with the „new man“. And the Tangoshows, with often classically trained dancers, who definitely needed more, than just a little practice on the dance floor. The Millennium brought Tango Nuevo, role-changing and women, who „just take the boleo, if the man does not lead it“. So now, women are supposed to participate actively in the dance. But what if you don‘t create a choreography with your partner and thus bring in your own personality? What if you don‘t want to exchange roles during the dance or make movements, that are not suggested to you? What about active participation in a fairly traditional, close-embrace Tango? There are still a lot of Milonguero or Salon teachers, who promote a quite passive woman‘s role: waiting for the man to invite her, waiting for the man to lead a step, to bring her back to her place. When I „grew up“ in Tango, I was told, that it‘s always the men‘s fault, if something goes wrong. Even then, I asked myself: why do we need classes, especially women‘s technique, if the quality and course of the dance is uniquely the men‘s responsibility? And then I had a look my early teachers or colleagues. And I saw lots of female teachers, who (although they were doing all of the organisation) left most of the talking to their male partners or let them choose the music for a demo. „HE has to interpret the music, I do not need to know about it.“ But hey! Don‘t you dance to the music as well, I ask them? What about your preferences, taste, needs? Do you just want to tag along? For me, it‘s all about making choices! But seriously: it‘s up to you, even in a Milonga, to show, how you want to dance. Show it by your posture, by your embrace, by your way to move. You may even convince an otherwise acrobatic dancer to dance a nice close-embrace Tango, if you demonstrate him, how wonderful your embrace can be. A lot of women never complain in classes for the sake of avoiding arguments. They just stand there and let the men figure out, what‘s going on. Very often they pout and are bored. Or they „help“ by anticipating every movement, he is supposed to lead. No, that does not help at all! Be constructive. Tell your partner, how you feel about a certain movement and it‘s communication, so that he can figure out the proper way to lead it. In case you‘ve got an idea of the proper lead, why not show him? Tell him, what an exercise is about, when he get‘s it wrong and do not wait until the teacher does. You loose valuable time! I do not want to encourage nagging and knowing-it-all, but an active positive participation in the process of learning is the pre-requisite for understanding and developing the dance. And of course: pre-requisite for giving constructive feedback is the ability to receiving it as well, as a friend just reminded me. Both partners bear responsibility for the outcome and can make mistakes! Know and choose your music. An active dancer needs to know the music and the possibilities it gives. Musicality workshops are not men‘s only classes! So, explore these possibilities, get to know the music, develop a personal taste and - for god‘s sake - dance only, when you really like the music. How can you interpret it, if you don‘t like it? In this case, you can just passively tag along. Knowing and loving the music enables those exquisite moments, where both partners move in unison, without being able to say, who is leading or following. They are both dancing to the music! Choose your partners at a Milonga. With the method of the Cabeceo/Mirada, both men and woman choose their partners for the next Tanda. Do not hesitate to use this method. You do not have to dance with everybody and accept every invitation out of fear or politeness. An active dancer chooses a particular partner for a particular music. If I want to dance to Di Sarli, I will choose a special man. If I want to dance to Rodriguez, I will choose another. And if the Di Sarli partner invites me to a Rodriguez Tanda, I may even refuse the invitation (politely), as I know, that he will not interpret this kind of music the way I like it. And if a man will dance a style I don‘t like, or does not communicate properly, or does not have the technique to make me feel comfortable, I will not dance with him at all - no matter to which music. I rather sit during a Tanda of Di Sarli, than dance it with a partner who will push and pull me around. Learn the basic principles of leading. Apart from enabling you to lead other women or men, this will open a whole new world of communication. With the proper technique of making a suggestion, waiting for the acceptance and then following the woman, a modern Tanguero will be open to your input. I do not speak about taking over the lead or doing stuff on your own, because he does not suggest it. I am talking about liberating spaces or blocking them and about subtly communicating your ideas. This may sound dubious, but with some time and maybe a couple of hints from appropriate teachers, you will figure it out. I do not have to mention here, that an mastery of the basic techniques is the requirement to a more active role in the dance. Do not even think about making suggestions to your partner, if you cannot stand, walk or pivot on your own! Choose to do decorations carefully. Unfortunately, active participation in the dance is very often mistaken as doing lots of decorations. But WOW, is this wrong! How often do I see women, who can barely stand, and have to lean on their partners for support, moving their feet frenetically, because they want to express their personality. That‘s bad on so many levels. Not only that it is totally annoying and prevents your partner from improvising, mostly it just looks nasty. But the most severe outcome from doing too many Adornos is that you have to shift the attention from the embrace to your feet. This will not only result in a loss of quality in the embrace, but you will definitely miss those moments, where you might communicate more actively as discussed in the former paragraph. So, concentrating on decorations might even prevent developing an active role in the dance. Don‘t get me wrong: a decoration here and then, to interpret the music is a nice thing to do. But just don‘t overdo it! And now that we‘ve talked so much about being active and participating in a modern and conscious way, I want to tell you: you don‘t have to do it! If just want to give over the responsibility to your partner, that‘s totally ok. Women do carry their lot in society, they don‘t have to in Tango. Social dance is about having fun, feeling good and should not become another field of competition or create stress. Even I sometimes choose to be passive: when the music is right and the partner dances nicely and I am tired of teaching and being aware and active, I just follow and enjoy the embrace. And this can be exactly the perfect choice.